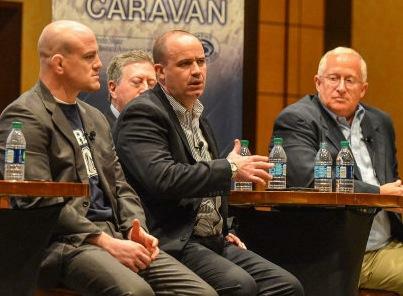 Left to right, at a Penn State coaches caravan event in Camp Hill, Pa., on Thursday: Cael Sanderson, Bill O'Brien and Russ Rose. Photo by Penn State Athletics. LANCASTER – Russ Rose is a cigar aficionado, elder pennstatesman, wry homespun philosopher and czar of all things women’s collegiate volleyball. At 59 years of age and after 34 years of coaching at Penn State, with four national titles, he’s seen it all. Twice. For those reasons and more, in late 2011 Rose was a member of the six-person search committee that recommended hiring Bill O’Brien to replace Joe Paterno. The longest-tenured head coach at Penn State, Rose was impressed initially by what O’Brien the coaching candidate would bring to the playing field. “What I liked most about Bill in that process is that he said, ‘I’m a helluva football coach. I’m a coach,’ ” Rose recalled here on Thursday, at the fifth of 12 stops of Penn State’s two-weeklong coaches caravan. And that’s what O’Brien was hired to be. But things quickly changed – and have stayed that way. These days, what Rose also likes about O’Brien is what he brings off the field as well – as exhibited along the banquet circuit, which this past week included Reading, Philadelphia, Washington, D.C., Baltimore, Lancaster and Camp Hill. It includes an Ivy Leaguer’s skillset of diplomatic yet honest talk, endless and polite banter, suit and (usually) tie, and pep talks to alumni and supporters of all ages. That was then, before sanctions and Freeh and Paterno’s death and enough ugly stuff to fill a Stephen King novel, three episodes of “Boardwalk Empire” and a King Lear reboot. Still, the search committee was not naïve – or clairvoyant. Enter O’Brien, on Jan. 6, 2012. Penn State bought itself a football coach for $2.3 million a year. But the Brown grad threw in being The Great Conciliator for free. At his four previous college jobs and one NFL stop, O’Brien never faced much media exposure (unless you count those 739,000-plus people who have seen the Brady-O’Brien spat on YouTube). Now, it’s a mixed bag. O’Brien jokes that he could walk along the streets of Philadelphia this week without being recognized. But at each stop of the caravan, fans and alumni often preface their questions with a 30-second protracted “thank you” for helping to restore Penn State’s name nationally. Joining O’Brien at stops in Lancaster and Harrisburg were both Rose, who is the winningest coach (1,096 victories) in women’s volleyball history and the owner of those four NCAA titles (2007-2010), and Penn State wrestling coach Cael Sanderson, the winningest wrestler in NCAA history. Between them, Sanderson and Rose have 11 NCAA championships. And an Olympic medal. And 1,355 victories. And too many Big Ten titles to count. That’s why, in an homage of sorts, the 33-year-old Sanderson was wearing an “O’Brien’s Lions” gray T-shirt on Wednesday and a blue version on Thursday. Quite a tribute, considering he guided the Nittany Lions to three straight NCAA championships. And that he won four of his own as an Iowa State University of Science and Technology undergrad, compiling a 159-0 lifetime record worthy of mention by Ripley’s and on a Bazooka Joe gum-wrapper. Sanderson, like Rose, may be an icon of an entire sport, but after 16 months O’Brien is an icon of the entire Pennsylvania State University – which is admittedly hungry for a positive face, even if it happens to have a receding hairline. The resultant ovations he is receiving on the road in Caravan Redux are attributable in part to person, to position and to circumstance. The lines are blurred and the circles are concentric. O’Brien, now and forever, is an important part of the patchwork quilt that is now Penn State. Maybe Chris Petersen or Mike Munchak could have sewn things up just as well. We’ll never know. At this point, no one wants to. For his part, O’Brien has embraced his fellow head coaches, in word and deed. 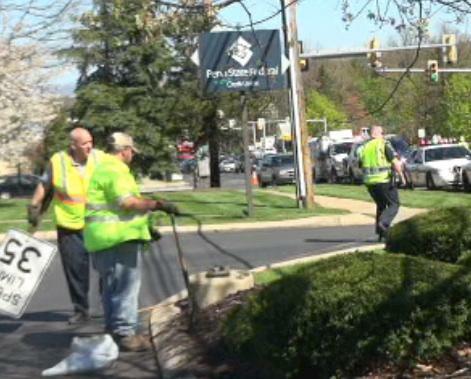 He was a regular at Nittany Lion basketball games and wrestling matches last winter, and on his schedule Friday is taking son Michael to the men’s lacrosse team’s CAA title game being played just across the street from his office. From one coach to another, Sanderson understands that all the caravans and press conferences are not what OB signed up for. (The math: Two pressers a day, for each of the six days of the traveling road show, 20 questions at each for a not-so-grand total of almost 500 overall.) Coaching is the only occupation both O’Brien and Sanderson have ever known. They love the strategy, the teaching, the competition, the kids. This other stuff – well, Sanderson just shakes his head. “They sell 100,000 tickets, we sell 6,000…at six bucks each,” Sanderson said, laughing at the comparison. Sanderson paused, realizing what he said. He gave a little smile and then a faux plea, knowing that O’Brien might put him in a headlock over his word choice. A State College street looked like the scene of an action-adventure movie Thursday afternoon, but this was all too real, and too scary. A police chase ended with a frightening crash -- and the suspects' vehicle on its roof.